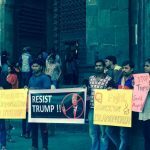 Thank you comrades & friends, #ResistTrump event in Bangalore was a phenomenal success. 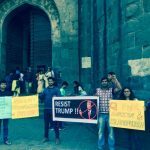 The ‘Bangalore Joins Global Resistance to Trump’ was a remarkable event, as we joined the #ResistTrump movement that has engulfed and raged around the world in continents. Though, the numbers were not commensurate as we expected (due to another rally/march held by the women’s organisation fighting Misogyny and Sexual Harassment, and a seminar on Demonetisation of Indian Currency, clashed with the timings of our event), nevertheless, the protest event was attended by the members of Karnataka Tamil Makkal Iyakkam (KTMI), Students Christian Movement of India(SCMI), Students Islamic Organisation (SIO), Students from Mount Carmel College, Bank Workers Union, and of course there was this good presence of uniformed and un-uniformed policemen around. The speakers at the event were Rajan Cinnaiah, President of KTMI, who inaugurated the event and spoke in chaste Tamil and said, why Imperialism has to be fought tooth and Nail. He gave a call to all those fighters, that the linguistic minorities such as Tamils, Kannadigas, Malayalees, and Telugu people have a common cause to unite against the inland Indian and foreign Imperialism. Protesting the Xenophobic, Islamophobic, Sexist and Misogynist Trump is more a bounden duty rather than a routine solidarity issue. 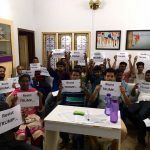 Amar Mansoor of SIO was very eloquent and brought the perspective of how all the minorities of the world have to stand together, he also spoke about Rohit Vemula and Najeeb of JNU, how they have been treated here, and drew parallels of what Trump, Modi & Putin of Russia represent and the common dictatorial agendas they have. 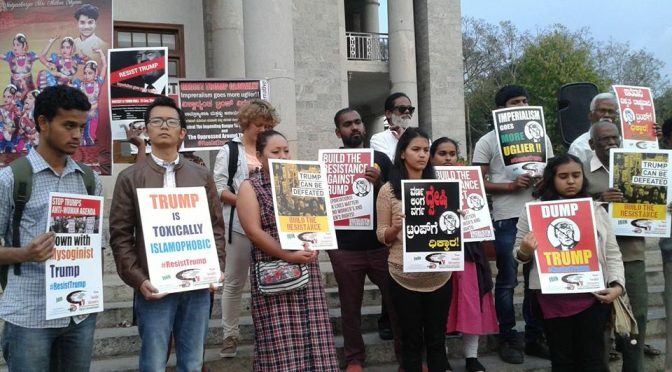 Dakerlin Mukhim of SCM who is from the sate of Meghalaya, who said “first I thought why protest a guy who has just been elected in a far of country, but once I came here, and heard the speakers and understood the nitty-gritty of the issue, I thought every one on earth must protest Trump and Trumpism” In their messages of Solidarity co thinkers and comrades of New Socialist Alternative, echoed very radical stand against trump and the need to build the resistance. Celebrated film maker, and the producer of America America Music video K.P. Sasi (which has been viewed more than a million times across the globe!) in his written message said “We are all aware that the victory of Trump in the presidential elections in the United States has serious implications to the marginalised sections not only in America, bu also all over the world. Given the context of the present political leadership in India, the victory of Trump can have serious implications on countries like India also. Therefore the call given for global resistance against Trump will serve us in such a way to prepare ourselves for the upcoming disasters India and the world may face in the near future. The racist, anti-woman, anti-LGBTQ, anti-minority, anti-immigrant and working class political stand of Donald Trump is well established. Therefore, it is not at all surprising that millions of people all over the world have responded to this call for global resistance to Trump. The youth, women, religious minorities, sexuality minorities, blacks, immigrants, indigenous people and all other marginalised sections have started protesting all over the world in large numbers. It is an act of preparation against the upcoming suppression of the marginalised and the environment. 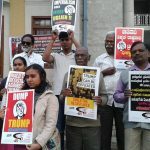 Comrade Fiona,from Ireland, said the following in her WhatsApp voice message(the gist) “Solidarity to our friends and comrades in India, this a greeting from Ireland, we are on our way into the Women’s March in solidarity with the women Internationally, particularly the fighting women of America who are fighting back against the Racist, Misogynistic agenda of Trump, we won’t accept that women should be treated in a Misogynist & Sexist way, women internationally will fight back to push this agenda under the stone, where it came from. Here in Ireland we are involved in campaign to have Abortion Rights in Ireland where abortion is illegal, we want the Church & the State separated, we want women to decide for themselves, if and when they have children. 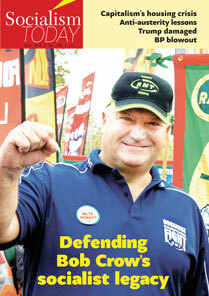 In order to defeat this right-wing populist agenda represented by Trump, we need on the 100th anniversary of the Russian Revolution the greatest event in human history for working class people, we need to organise ourselves as working class people Internationally, here in Ireland,in India and everywhere else, to fight to change this system, the capitalist system, which is what represents the sexist and unequal society, we will organise past today to change this system. Weizeman Hamilton, General Secretary of WASP, South Africa, who is on the International Executive Committee of the CWI sent this WhatsApp message to the protest “ The Workers and Socialist Party of South Africa, stand in solidarity with the American Working Class in the face of the imposition of a bigoted, right-wing in the recent memory, This is a president who is unashamed racist, xenophobe, homophobe, transphobe, misogynist, whose cabinet members believe that Islam is a Cancer, this cabinet is populated by white supremacists, which believes that Climate Change is a fiction. We must stand with the American working people to defeat the dream of this president to serve even one term….The lesson of the rise of Trump is that the working class needs its own voice, the voice of the 99% against the 1% represented by Trump. 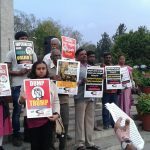 Vishwanath Singaiah, Bangalore organiser of New Socialist Alternative, spoke and made a very audacious and political financial appeal, and said the working class and the oppressed needs the Cash, to fight the bigots like Modi & Trump, and only the ordinary working people can sacrifice their hard earned money can invest in such a class act. The fighting fund collection was successful in raising Rs.1063/- from a small gathering of 30 to 35 protesters. Narasimha Murthy, was in charge of the Press & Media, his efforts had brought many national and local channels to cover the event.The over all moderation an anchoring of the event was done by Jagadish Chandra, National Organiser of New Socialist Alternative, who elaborated upon the phenomenon of Trump, and how we can defeat it, and stressed upon the need of unity in the face of Racist, Jingoistic attacks against Dalits, Muslims and Linguistic minorities in this country and everywhere. 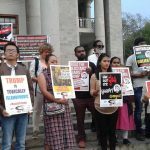 Comrades of New Socialist Alternative (CWI-India) in Pune & Chennai also successfully organised and held #ResistTrump events, in solidarity with Global Resistance to Trump. It doesn’t matter if we were less in numbers, but we were part of the HISTORY IN THE MAKING. The American working people, the giant has started moving, notably leading them are the Women, Blacks and the Student Youth who are the oppressed in that society. The massive resistance that was evident in city after after city on 20th & 21st Of Jan. are just the first notes of the music ensemble of the future. In solidarity with them every country of Europe, had massive downpour of people on to the streets, notable among them were; Ireland, England, Germany & Sweden where the forces of Committee for a Workers International (CWI) played a decisive role in mobilisations.